Pathworking is a form of guided meditation, using a story rich with symbolism for self-discovery, personal development and magical learning. A new book by Fiona Tinker in the Pagan Portals series, called Pathworking through Poetry, shows how poems can be the ideal words to meditate on for this purpose. bards and poets from many eras and traditions. Poetry is full of symbolism, imagery and connotations which pass on meaning." In Pathworking through Poetry she uses poems from Scottish and Irish writers, such as WB Yeats, and concentrates on Celtic mythology. Poems about the goddess Bridget, who is associated with poetry, magic and healing, and Angus Òg, the Irish god of love, music and poetry, are explored for their meanings and then woven into actual guided meditations. The second part of the book looks at how poetry can be used within ritual. It offers a rite to celebrate the sacred marriage at Beltane of Angus and Bridget as an example. The complete words are printed, so it could be run as it is by a pagan group, or used for inspiration. Part three looks at poetry as a means of transformation. Fiona says: "Some poems can allow us to see things differently from the way we normally look at them, allowing us to develop and change our understanding." She uses Yeats' poem The Collar-Bone of a Hare, which he wrote at a time in his life when he felt he had lost the woman he loved - the Irish Nationalist fighter Maud Gonne. He needed to find a way of changing his perspective in order to move out of despair, and achieved this through writing poetry. Fiona has adapted The Collar-Bone of a Hare into a pathworking we can use for difficult transitions: "Seeing what is really there, letting go of the illusions and the acceptance of change being something we can choose to address, no matter how painful." 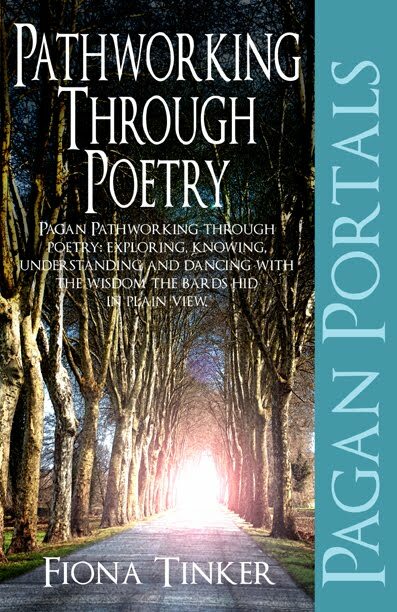 Pagan Portals - Pathworking through Poetry is a beautifully written and practical book for pagans who love poetry and Celtic mythology, using the words of the bard for personal transformation. Publisher Moon Books says on its website: "This book explores how poetry can help develop a pathworking through exploring wisdom hidden in plain view. It is a look at creative processes, inspirations, how nature and the Divine move us – and how to apply this on a personal level to pagan pathworking." Pagan Portals - Pathworking through Poetry:Pagan Pathworking through poetry: exploring, knowing, understanding and dancing with the wisdom the bards hid in plain view.